Twitter, is a platform that lets you reach people of all countries with your ideas, thoughts and opinions, although there is a barrier that is very difficult to pass. We refer to the language and that, unless you are multilingual, it will be difficult to tweet in several different languages. This is where comes to play Translate Twitter Tweets, an application for Twitter that allows you to send your messages translated in several languages, without much work and with only a few small codes into your tweets. 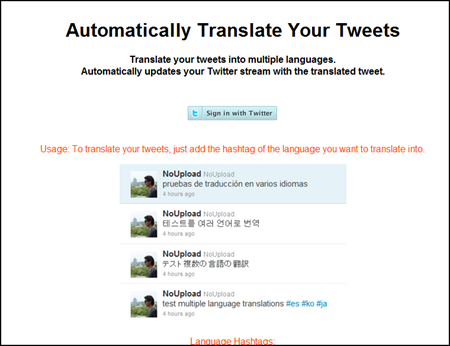 Free, Translate Twitter Tweets, is a really useful application if you want to reach a truly global audience. 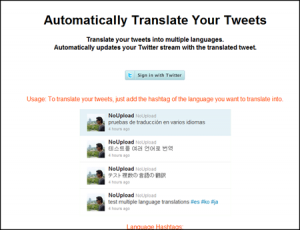 With only give you access to your Twitter account, you can make your posts are published in several languages. The only thing you have to do is, to write, add a tag with the language to translate, #en for English, #fr for French, #pt for Portuguese and even #ja for Japanese, among a number of other languages, becoming a truly international Twitterer.